Granite as a material is superb for the production of surface tables; excellent wear resistance, low coefficient of expansion and great load bearing characteristics are all amongst the great benefits. The ability to hand lap the table at site if and when it becomes necessary makes the service support of the product an excellent economic choice. Eley Metrology has been providing granite surface plates and tables to industry for over 40 years. In metrology, it is very common for customers to require threaded inserts to hold or clamp items in place during the measurement process. One area of caution must be observed if these clamping inserts are needed. In our experience, steel inserts must be fitted through the full thickness of the granite. A hole is drilled to clear the threaded insert. The insert will be manufactured with a head that locates on the underside of the table as this allows any clamping pressure to put the granite in compression. 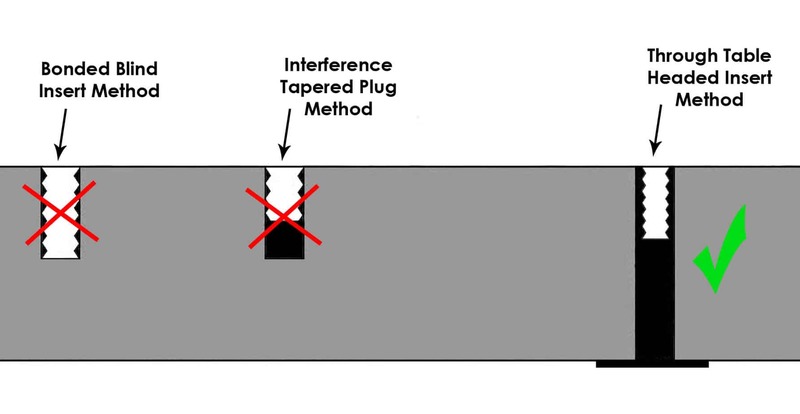 Eley believes that other methods of bonding or interference must be avoided, as they are secured into a 'blind hole' in the table top. Over tightening will either pull the insert out of the hole or worse, break a 'funnel-shaped' piece of granite out of the surface of the table. This damage can not be reversed in any satisfactory manner. Whilst the through table threaded insert is slightly more expensive, it is now becoming universally accepted as the only way of providing a safe and satisfactory threaded insert alternative. If you’d like more details about our Granite Surface Tables Accessories, then our team are available to help.